Who can afford to give up AU$320,000 (RM970,000)? You can’t? Well, the CID Chief can! Contrary to what the IGP said, the Australian police did not ‘clear’ the CID chief but instead acted upon their suspicion and seized A$320,000 deposited under Australia’s Proceeds of Crime Act. 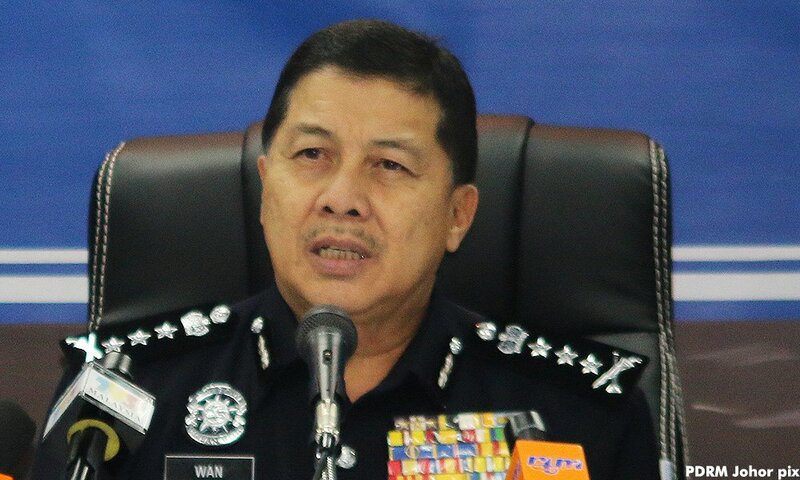 The Australian Police Force (AFP) said the seizure of A$320,000 (RM985,000) belonging to Bukit Aman CID chief Wan Ahmad Najmuddin Mohd was based on the suspicion that the country’s anti-money laundering law had been violated. The comment was in response to Malaysiakini seeking feedback from the Australian police on Malaysian inspector-general of police Mohamad Fuzi Harun claiming that his Australian counterpart had cleared Najmuddin of criminal wrongdoing. An AFP spokesperson said the forfeiture action under Australia’s Proceeds of Crime Act 2002 was aimed at assets instead of individuals. “Proceedings in the matter referred to in your request were finalised by forfeiture order in April 2017. “These proceedings were civil based proceeds of crime action and were brought against property (the credit balance of a particular bank account) and not against a person. “This action was based on there being a reasonable suspicion of unlawfully structured deposits into the particular bank account contrary to Australia’s anti-money laundering laws,” the spokesperson told Malaysiakini. A TOTAL of 54 transactions, each below the threshold of AU$10,000 (RM30,210). In any country in the world, it would surely raise eyebrows, let alone suspicion. More so if its into the account of a policeman. Commissioner Wan Ahmad Najmuddin Mohd is a top police officer, not any ordinary policeman. He was Johor police chief and now heads the country’s Criminal Investigations Department. Not only that, he told Australian authorities that he would not claim the AU$320,000 (RM970,000) they had seized. Despite it being from the sale of his house and was to finance his children’s education. Minister in the Prime Minister’s Department Paul Low Seng Kuan, who oversees the country’s fight against graft, said the Malaysian Anti-Corruption Commission should investigate this case for “improper conduct”. His views were shared by several civil society groups. QUESTIONS: Where did Wan Ahmad get the RM338,357 which he declared to Australian customs in 2011 and 2012? Was this amount also from the sale of his house? Who deposited the money into Wan Ahmad’s accounts? And why were the deposits made at various branches across Australia? The flow of money did not stop there. An affidavit sighted by SMH further revealed money again started to flow into the account in 2016, after it was dormant for years. This time, deposits were made at five different states – from Biloela in Queensland to Devonport in northern Tasmania to Lakemba in Sydney’s west and Melbourne, six days after Wan Ahmad visited Australia in September 2016. There were 54 transactions, each deposit below the threshold of AU$10,000(RM30,210). Anything above that amount will get the attention of the Australian authorities. In just one month, the amount that was deposited into Wan Ahmad’s account was AU$290,000(RM875,961). The money was allegedly for his daughter’s master’s programme. SMH also reported that investigators found that Wan Ahmad, who was then the Johor police chief, had entrusted the transfer of his money to a close friend, Seenisirajudeen Mohamad Basith, an Indian national who has since returned to India. QUESTIONS: Who is Seenisirajudeen Mohamad Basith? Why didn’t Wan Ahmad simply get the money transferred from a Malaysian bank to his bank in Sydney? What was he trying to avoid? And again, was the RM875,961 also from the sale of the house? SMH also reported that Wan Ahmad Najmuddin did not want to his money back for the simple reason that court action was too expensive. QUESTIONS: Who would simply want to give up close to RM1 million? How is his daughter’s studies being funded now? Will her studies have to be postponed? According to a source familiar with such transactions, people would avoid the conventional way of money transfer (bank-to-bank) as large amounts, like in the case of Wan Ahmad, would get the attention of Bank Negara Malaysia and various government agencies. “There will be too many questions to answer. Where did the money come from? Why is it being sent overseas? Proof and documentation must be provided. “There is just too much hassle and red-tape involved. So, to circumvent all that, they get a cash-rich friend staying in that country to make the deposits into that account. “The sum involved, will be paid by the sender to his friend here. Simple, no questions asked,” the source said. For several years, the account lay dormant. Then, six days after Mr Wan Ahmad Najmuddin’s final trip in September 2016, cash deposits from five different states began pouring in. Analysing the constellation of transactions – 54 of which fell below the reporting threshold – the Commonwealth Bank and the financial crime tracker AUSTRAC became alarmed. “There does not appear to be any apparent lawful reason for the form and manner of the deposits,” an AFP officer from the Criminal Assets Confiscation Taskforce wrote in an affidavit. When the bank first told Mr Wan Ahmad Najmuddin it planned to close the account, a reply came from a hotmail email address asking for the balance to be sent as a cheque. Mr Allaudeen Abdul Majid of the integrity unit said Malaysian police had fully investigated the matter, finding the funds were lawfully obtained from the sale of a house. Investigators found the police chief had wanted to send money to his daughter, entrusting the transfer to his close friend, Seenisirajudeen Mohamad Basith, an Indian national who has since returned to India. BUKIT Aman Criminal Investigation Department chief Wan Ahmad Najmuddin Mohd should be able to easily get his close to RM1 million back from Australia by offering up a portion of it. “He should have no problems getting a lawyer if he offered them 50%, or more, of the A$320,000 (RM969,000) as legal fees, after the money is successfully retrieved,” DAP’s Segambut MP Lim Lip Eng said in a statement. Lim said he was “shocked” by Bukit Aman’s and the Home Affairs Ministry’s explanation that Wan Ahmad was absolved of any wrongdoing because he was “naive” about Australian laws. “It seems like the Inspector-General of Police Mohamad Fuzi Harun has no choice but to accept whatever excuse is given,” Lim said. “It doesn’t matter that the police has failed to explain why Wan Ahmad had to go through a foreigner to carry out structured deposits of less than A$10,000 in several territories throughout Australia. “It also doesn’t seem to matter to the inspector-general that the money channelled by Wan Ahmad might have gotten mixed up with dirty money. Lim said that Wan Ahmad could have used the “No-Cure, No-Pay” legal service, where charges are only levied at clients after the money is retrieved. “It seems that people as ‘naive’ as Wan Ahmad now need to understand that Malaysian authorities can just accept the ignorance of the law as a valid reason,” Lim said. “And the accused can now avoid prosecution by saying the he did not know that his actions had broken the law, including those of foreign countries.” – March 4, 2018. This is NOT the way.Please communicate with the Australian Ambassador and discuss the issue. We can’t accuse everyone in the world of treating us badly or trying to put us down. DEPUTY Home Minister Nur Jazlan Mohamed today questioned the actions of the Australian authorities in using the media to reveal the case of the frozen bank account belonging to a Bukit Aman Criminal Investigation Department (CID) director recently. He said the Australian authorities should have taken action against Wan Ahmad Najmuddin Mohd immediately if it was proven that the latter was involved in money laundering activities, as claimed in the media report. However, Nur Jazlan said the failure of the Australian authorities to do so raised questions about whether they had “an axe to grind” in the case. “I have no idea why the Australian government had done so (revealed information via the media). If this was a crime involving money laundering, take action (against the CID director). “However, that was not the case. They only used the media to embarrass Malaysia,” he said after officiating SK Taman Bukit Kempas’ Parents and Teachers Association’s annual general meeting in Johor Baru today. Nur Jazlan was commenting on a report that Australian police had seized A$320,000 (RM971,728) in the bank account of Wan Ahmad Najmuddin after it was suspected that the money was part of money-laundering activities. Wan Ahmad Najmuddin bin Mohd, now the head of Malaysia’s criminal investigations department, opened a Commonwealth Bank “Goal Saver” account in 2011, listing his address at Bankstown and then Glebe in Sydney. Mr Najmuddin has not tried to wrest the money back from authorities, saying court action was too expensive, but has denied any wrongdoing. Mr Wan Ahmad Najmuddin, 59, has said he arranged for a close friend in Malaysia to transfer the money to pay for his daughter’s master’s degree. Malaysian police cleared their officer in an internal inquiry after being alerted by the AFP. At the time of the suspicious deposits into his account, he was head of police in Johor state, and a frequent traveller to Australia. Since 2001, he has visited nine times, always on a tourist visa, often for less than a week and, sometimes, with lots of cash. Across three trips in 2011 and 2012 he declared $112,000 to Australian customs. It was on one of the 2011 trips that he opened an account in his own name at the Commonwealth Bank’s Haymarket branch in Sydney’s CBD. And in December the next year, one day after he arrived in Australia, $30,000 landed in the account (from deposits at Merrylands, Ryde, Strathfield and Burwood) while $8000 was withdrawn at Haymarket. The cash he brought into Australia and the bank account were for Mr Wan Ahmad Najmuddin’s son’s aviation studies, according to the assistant director of the Royal Malaysian Police integrity department, Allaudeen Abdul Majid. Six months after the funds were seized, AFP liaison officers in Kuala Lumpur posed for photographs with Mr Wan Ahmad Najmuddin on his appointment to the role of criminal investigations director. It is not known how his close Indian friend was said to have arranged for the hundreds of thousands of dollars to reach Australia. BUKIT Aman’s criminal investigation department chief Wan Ahmad Najmuddin Mohd has had A$320,000 (RM971,728) seized by Australian Federal Police from his Sydney bank account on suspicion of money laundering, the Sydney Morning Herald reported. Najmuddin, however, is not fighting to have the money returned. The report said Bukit Aman had already cleared him after an internal inquiry which followed an alert from Australian police. Najmuddin, who was promoted to CID chief in April last year, had purportedly said his bank account there which was opened in 2011, was for money to pay for his daughter’s master’s degree. “The account balance grew by nearly US$290,000 in a month, mostly in structured deposits below US$10,000, the threshold above which law enforcement agencies receive mandatory notifications,” SMH reported. SMH quoted Allaudeen Abdul Majid of the integrity unit saying Malaysian police had fully investigated the matter and found that the funds were lawfully obtained from the sale of a house and that Najmuddin had wanted to send money to his daughter. Allaudeen had also said that Najmuddin had asked a close friend, an Indian national named Seenisirajudeen Mohamad Basith, to handle the transfer of funds for him and the money was transferred without compliance to Australian laws. “The whole episode was an oversight. No malice was intended to break any laws including Australia’s,” he was quoted as telling Australian investigators. The Malaysian Insight has contacted Wan Ahmad and Inspector-General of Police Mohamad Fuzi Harun and is awaiting their response. – March 2, 2018. The report said Australian Federal Police suspected a “flurry of suspicious cash deposits” into Najmuddin’s Commonwealth Bank “Goal Saver” bank account, which had been laying dormant after it was opened in 2011. “There does not appear to be any apparent lawful reason for the form and manner of the deposits,” an Australian police officer said in an affidavit sighted by SMH, to apply for the account to be frozen. The report said deposits below A$10,000 had started coming in a week after Najmuddin visited Australia in 2016. “Unknown depositors visited branches and ATMs around the country, from Biloela in country Queensland to Devonport in northern Tasmania to Lakemba in Sydney’s west and Melbourne’s CBD,” the report said, adding that Malaysian police had cleared Najmuddin of wrongdoings. “The IGP is aware of the case,” said Najmuddin in a short reply, adding Bukit Aman’s Integrity and Standard Compliance Department had already investigated the case. When contacted by SMH, Najmuddin said the money was meant to pay for his daughter’s master’s degree, and was arranged by a “close friend in Malaysia”. This entry was posted in Uncategorized and tagged Australia freezes Malaysia's CID Chief's bank account.... Bookmark the permalink. 1 Response to Who can afford to give up AU$320,000 (RM970,000)? You can’t? Well, the CID Chief can!